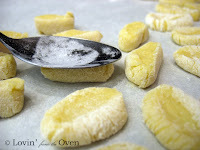 My husband loves Gnocchi (no-kee), a small Italian potato dumpling. He orders it every time we eat out and I have always passed it by. Until now. I have discovered that I love Olive Garden's Chicken Gnocchi soup. It was creamy, light, and had pillows of gnocchi that melted in my mouth. 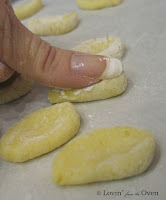 I just HAD to learn to make gnocchi. 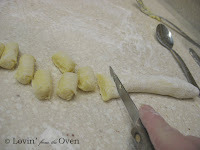 I searched all over the Internet and found that there are several ways of making gnocchi and that it was a little time consuming. Undaunted, I kept looking, until I remembered that I have a cookbook from my husband's great aunt, The Italian Cookbook, by Maria Luisa Taglienti. It was given to her in 1961 from her mom and given to us in 1989. Although it calls for boiled potatoes, I decided to heed the recommendation of the Internet cooks and used baked potatoes. I also used a potato ricer, which yielded a light, fluffy potato mixture, which I believe contributed to the melt-in-my mouth gnocchi. Yes, it is a simple recipe. Was it difficult to make? Not really. I guess my bread making experience helped a little. Once I riced the potatoes, added the eggs, salt and part of the flour, I just kept adding flour until the dough was manageable and not sticky. I cut the dough into six pieces, then rolled each piece into a log. Some recipes suggest rolling the dough into a 3/4" diameter log, but I just kept rolling until it was about 2/3". By then the dough had softened and refused to hold its rolled shape. If the dough becomes too sticky, just sprinkle the surface with a little more flour. Here, I am cutting the log into 1/4" slices. The recipe says to cut into 2/3" pieces. Oh well. I wanted bite sized pieces, not large chunks! 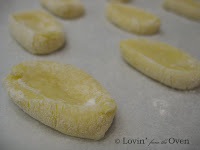 Here's a close up of all my cute little gnocchi...in a row. Now, I tried "rolling" those little guys on the backs of dinner forks, but they just wouldn't cooperate. They were just too soft. Oh, what cute little dumplings they are! put it into a freezer bag! Have a large saucepan ready with boiling water with 2 T. salt. and remove with a strainer/slotted spoon. Wash potatoes and prick skins with a fork. Wrap in foil and bake in a 400 degree oven for 1 hour or until soft. Cool unti able to handle. Cut potatoes in half and scoop out flesh. Mash with fork or use potato ricer until you have 2 1/2 cups of mashed potatoes. 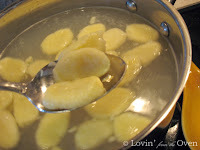 Place potatoes, eggs, and salt in mixing bowl and mix thoroughly. Add 1 1/2 c. flour, mixing well. Place dough on floured surface and add rest of flour, a little bit at a time. Knead dough for 3-4 minutes. If dough becomes too sticky, sprinkle surface with more flour. Cut dough into six pieces. 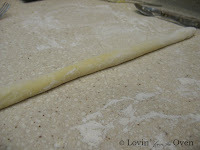 Roll dough into long sausage-like strips and cut into pieces 2/3" long. Sprinkle dumplings with flour. 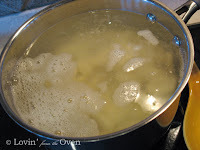 Have ready a large [an with boiling water to which 2 T. of salt have been added. Place 1/3 of dumplings in boiling water and remove with strainer when they rise to top. Place in hot serving dish and repeat operation until all dumplings are cooked. Keep water boiling. Add sauce to dumplings and 2/3 of cheese, mixing well. Sprinkle rest of cheese on top. Serves 4-6. **This recipe is dedicated to my sweet mother-in-law, who passed away this past week from a short battle with ALS. I made roasted chicken gnocchi soup, which was one of the last meals she was able to eat. This looks great! Now I am craving gnocchi! Wow Frieda! You're a champ. I can't believe you figured out how to make that. It looks delicious! I'm so sorry to hear about your mother-in-law. 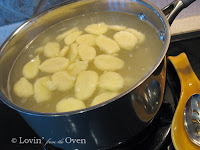 Thank you for sharing this recipe - I've always wanted to make gnocchi at home! 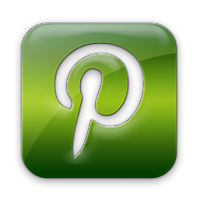 I made these last week and they are really fun and easy. My kids loved the shape and they really take on the flavors of the soup. I'm also going to try boiling them then pan frying them in a little butter and nutmeg as a side dish. Thanks for sharing. 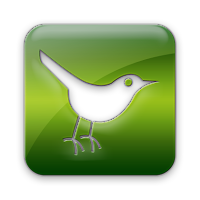 Toni, I LOVE it when a reader makes one of my recipes and reports back ~ thank you! Your idea of pan frying and a touch of butter sounds delish! I am going to have to try these. 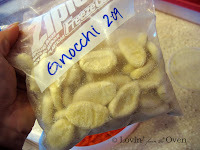 I've been looking for a gnocchi recipe and my kids (3 and 5) would love to help make these. Ok, I'm totally going to have to give this a try very soon! !